Believe it or not, negotiating the rate of your rental car is something that can be done with relatively little effort and can end up saving you a lot of money. There are multiple car-rental agencies out there and knowing that is what is going to get you one step ahead when it comes to negotiating and getting the best car rental deal. Here are a few tips to keep in mind next time you are in the market for a rental car. Believe it or not the big name car companies do not offer the lowest prices or best deals. Their strategy in the market is to create a monopoly over car rentals. A lot of the big names have been acquiring smaller car rentals companies left and right but the fact of the matter is that there are still many small companies out there that are most willing to fight for your business in order to keep their doors open. Try these places first and you’d be surprised what they can offer you. The price that you are paying for a rental car for the airport is at a much heftier price tag because of the mere convenience you are receiving by not having to leave the airport to find a rental car. The fact of the matter is that by leaving the airport and going to a car rental company somewhere else, you can often save up to fifty percent. Often times if you are traveling, a car is not the only thing that you will be renting. If you are staying in a hotel or flying somewhere, you can often times look for package deals that include rental cars. These offer a huge savings, but may require a little more work and planning than just booking everything separately. Let’s face it, it is human nature to put things off or procrastinate. Travel agencies and other industries related to travel, know this and take advantage of it. It is for this reason that you can often time save a lot of money by booking your rental car early. However, this is not a foolproof rule. It is wise to check back a few times leading up to your booking date and make sure that rates have not dropped. If they have there is no penalty for cancelling your reservation and taking advantage of the lower rate. If you are a part of a large organization, whether it be your employer or your insurance provider, chances are you will be able to cash in on a discount offered by this organization for your rental car. Aside from that, the internet provides as a great resource for searching for coupons or other discounts. There are actually whole websites devoted to finding you coupon codes and discounts or specials. How have you had success in getting the best car rental deals? Sometimes the bigger name folks can be cheaper if you get a deal on a discount site like Expedia. Also, remember that when you’re going to less populated areas, sometimes you get a way nicer car than you paid for because they often overbook their rentals. When I was in Jackson, WY, the small rental car facility there gave me a nice sedan for the price of my compact because of overbooking. Thanks for these pointers! 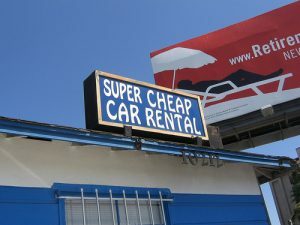 There is no one way to save on rental cars other than being proactive! I’m okay with small car rental companies, but I always do background check first. It’s a good idea to always do your due diligence when spending money with any company you aren’t familiar with. Good tip! Collecting coupons is definitely a good option. If you have planned a travel for the near future, then it is best to look in the daily newspaper for discount coupons. You can also keep an eye while buying items online as these accumulate reward points that can be refunded.